Beri O’Dell is a monster hunter searching for answers and spending her time tramping through the Florida wetlands. When she gets a panicked call from her sister about a new creature stealing people’s souls and sending them into comas, she races back to Jacksonville to help. Problem is, by the time she arrives, her sister has fallen victim. In a race against time and with the help of a witch, a necromancer, and a gorgeous ancient warrior, Beri will do whatever it takes to save her sister’s soul. 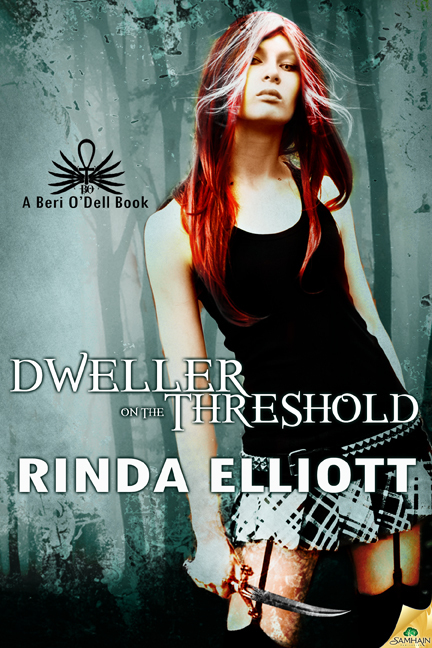 Dweller on the Threshold has everything I love about urban fantasy: strong worldbuilding, a kickass heroine, a solid and entertaining group of supporting characters, and enough smolder to set a room on fire. Beri’s a bit different from your usual tough-girl heroine. She’s spent most of her life wondering what she is. Taller than your average woman, with attention-grabbing copper-colored hair, she can see through the different dimensions and has super strength to boot. Not many people can handle that much awesome in one package. So meeting Nikolos, a man who’s not only taller than her, but finds her strength and abilities attractive, sends her into a bit of a tizzy. And I need to take a moment here to pay homage to Nikolos. Normally, longhaired guys just don’t do it for me, but I have to make an exception for Nikolos. Tall, strong, moves with an easy grace, has a dimple…Yum. With a capital “Y.” The chemistry between the two of them is an almost physical thing, their connection so strong that everyone around them keeps telling them to get a room. I loved how he made Beri feel normal and less like a freak. He has his own issues, and the way he chooses to deal with them is frustrating, but at the same time, why and how he does it is understandable. The world Rinda Elliott’s created is detailed without being boring. Twisting karma, astral projection, Greek mythology and demons I would have expected to see in an episode of Grimm, it’s a complicated mix grounded in the heat of a Florida autumn, and if I got a little turned around at times, I’m pretty sure that was okay—so did Beri. Elliott sets a brisk pace, covering a lot of ground and a lot of information in a handful of days. Everything’s on fast forward, and by the time I reached the end, I had to re-read the ending twice to make sure I wasn’t missing something. Then I kept hitting the continue button on my Kindle. I mean, that couldn’t really be the end, right? But it was, and the only thing keeping me from throwing the Kindle was the fear I’d damage the device. The set up for book two makes me glad I only have to wait until October to read it, because otherwise you could probably hear me screaming in frustration in the next county. I’m very curious about this one, I’ll have to buy and try it! thanks for the review! The world-building sounds saweeeeet! And it takes place in Florida! Double win!